Recently, I’ve been reading aloud once a week to a group of two- to four-year-olds at my local library. Because I’ve spent many years teaching Kindergarten and older students in “Big School”, I was pretty confident I knew all about sharing books with young children. Not so! Here are some of the things I’ve learned, and others I’ve re-learned from this delightful group. Are these lessons you’ve already learned, or might some of them be new to you too? 1.There’s no point in being a book snob. A great book to a three-year-old may be one with a pink sparkly cover, or a story thrown together about a TV character, or any book with flaps to lift. The main aim of sharing books with kids is to HELP THEM LOVE READING. 2. If a two-year-old wants to stand in front of the group, obscuring the book, it’s best to move the book, not the two-year-old. Quieter that way. Upset kids or tired and cranky kids aren’t in the right space to learn to love reading. 3. Little ones are easily distracted. A book needs to be short and punchy to hold their attention. Keep longer narratives for older kids. Limit the opportunities for distraction. If toys arrive at Storytime, explain to the toys how you want them to behave. 4. Preschoolers are used to being entertained by a range of media. Use all your wiles to bring a story to life for children. If they start itching, yawning, rolling around, or falling asleep, it’s time to change tack. Fact: once any child needs to visit the bathroom, each child will feel the same need immediately. 5. Kids under five need movement breaks. Be sure to include lots of opportunities for them to move. The natural way to do this is either to interrupt the book and act out a section, or come back to that part when the story is over. If there’s roaring, have kids roar. Loudly. If there’s climbing, everyone can climb. But probably not on the shelves. 6. Sharing a story is not a one way communication. Give children a chance to react to a story, and involve them in the telling/reading where possible. They love to connect parts of a story to their own lives. It doesn’t matter if an adult can’t see the connection. 7. Strong rhyme and rhythm in a book will not only have huge appeal to children, it will also help them memorise a book after repeated sharing. Memorising is an important step along the road to reading, and it helps books become familiar. 8. Little ones love to revisit a book friend. They adore it when they can predict what will happen and even “read” some words. They get excited about books and reading, and that’s why we share books with them, to HELP THEM LOVE READING. 9. Some children don’t feel comfortable sitting in a designated story place, or even sitting at all. Just because a child isn’t conforming to a particular stance, doesn’t mean they’re not learning to LOVE READING. And that’s what sharing stories with kids is all about. 10. Routines need to be flexible. Just because Storytime has evolved a certain way doesn’t mean it’s set in concrete. 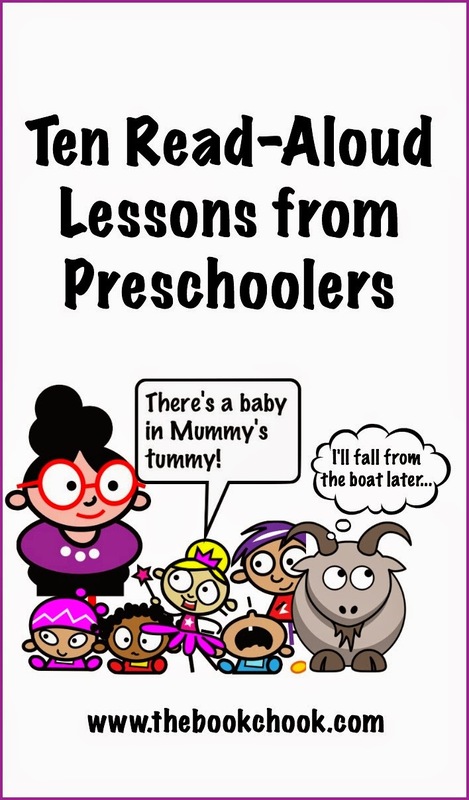 If a soon-to-be big sister interrupts a page about a goat falling out of a boat with the news that there’s a baby in her mummy’s tummy, go with the news. The goat can fall from the boat later. If you're interested in children's reading, why not check out other articles by clicking Reading in my right sidebar? And if you think you know someone who may appreciate this article, please share it with them! Thank you Susan. Sounds like my Wednesday morning visits from preschool. Lots of vague links, wriggling bottoms, comments, and intense watching and listening. I enjoy my break with the 3-4 year olds too. Lovely idea to have them visit before they start big school, Bernadette!